Surviving Ireland: A Survivor's Guide to Living in Ireland - New Edition Available! A Survivor's Guide to Living in Ireland - New Edition Available! The New, Rewritten, Up-To-Date Version of A Survivor's Guide to Living in Ireland is Now Available! A few years ago, I had the opportunity to write what I hope is a fun, interesting, and fairly informative book on living in Ireland. The book, A Survivor's Guide to Living in Ireland, has done rather well, I'm proud to say. By the way: any feedback very much appreciated! The Cost of Living HereIreland’s ever-changing housing industry: where and what to buy. When Richards moved there, he bought a house for just over $15,000. While housing costs had increased substantially during the Celtic Tiger years, they are now falling fast and are less expensive now than they have been in years. Perhaps you too can own a thatched cottage within earshot of a babbling brook. Richards shows you how. Work PermitsThat elusive work permit: how to get one. Did you know that you will have to get your hands on a work permit to be allowed to work? Richards lets you in on the secrets of obtaining one for yourself. Getting a JobMaking a living in Ireland: unless you have a rich Uncle, you probably have to work for a living. Celtic Tiger Ireland added an entrepreneurial spirit to this country, and small businesses drive Ireland’s economy. Richards gives an on the ground analyse of and the opportunities that are available in its modern, fast-paced economy, even in current market conditions. The virtually free Medical System: Ireland has socialised medicine, one that won’t strip away your retirement nest egg if you happen to get sick. Richards gives you some examples of its incredible entitlements. The High Quality of EducationA School and University system to die for: the author’s three children have all grown up with the benefit of a system with which Richards has fallen in love. His glowing but realistic account illustrates how your offspring can also benefit from what he considers to be one of the best school systems anywhere. Few expats write of the sometimes-difficult transition faced by immigrants. But Richards does. As he says, “…move here and the odds are that you’ll never go back. I say this because it’s something to think about before you choose the path of immigration, and it’s an issue that I find is rarely discussed. ‘Immigrating is hard work. It can be an emotional roller coaster out of which few emerge unscathed. Due to ever-increasing demand for this E-Book, A Survivor’s Guide to Living in Ireland has been substantially revised and expanded. This 2009 edition is now bigger, more entertaining, and more valuable than ever before. With well over 200 pages of humour and insights, this book also includes important and up-to-date Internet references to help with further research, as well as Richards’ personal (and funny!) Dictionary of Irish Slang and Phrases to help you to talk like the Irish do. Loaded with facts, anecdotes, and lessons learned by a fellow American from Chicago – a regular guy just like you – A Survivor’s Guide to Living in Ireland is necessary reading for those who are thinking of either visiting this country for a prolonged stay, or those determined enough to move here permanently.The picture that Tom Richards provides in this book is much clearer and experiential than those written only from a perspective of rose-colored poetry. A Survivor’s Guide to Living in Ireland provides factual information written in a style that travel writer Bill Bryson would appreciate, and illustrates what a move to Ireland requires…and captivates the reader by explaining exactly what living in Ireland is really like. 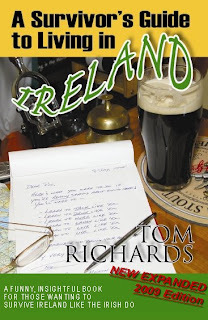 Tom Richards' wouldn't leave Ireland on a bet. Written without any punches pulled, this is the book to read if you've ever thought about moving to that marvellous country. where can I get a hardcopy of the new book? I am hesitant.. should I quite my graduate job & take risk.. or take vacation & just attempt applying for jobs for the month I'll spend in dublin? Wondering if I should get a kindle version of your book & whether the work permit section will actually help me!? Morning Ahmed... Hmmmm...that's a thorny decision. My gutt reaction is to take the second option: come over on holidays and check things out. Who knows? a) you might not like the place at all. In which case you'll want to go home (I've seen this happen all the time and it's no big deal) or b) you could pick up a job or c) you'll be able to do some on-the-ground research; make some contacts, see how your skills will apply hear; talk to some employment agencies; maybe talk to an Irish University about continuing grad work in Ireland?